“The Cowboy” Ric Maverick vs. “The Incredible Primal Prodigy” Matt Kenway (Look At Him): This was a rematch from the previous Glen Carbon show where Maverick scored the victory over his rookie opponent. I will stop hammering that lame running gag about Kenway into the ground…eventually. Despite Kenway usually being the rulebreaker in shows around here, this seemed to be a battle of fan favorites as it played out (though a few people still booed Kenway). Kenway cut off Maverick’s rally with a Union Jack-style cobra clutch neckbreaker, then got the surprise tapout win with an Anaconda Vise in 5:09. C.J. Shine vs. The Snitch: Sophie Darling was absent from Snitch’s corner, leaving the masked man to silently protest about the abundance of fans attempting to take pictures with their phones. 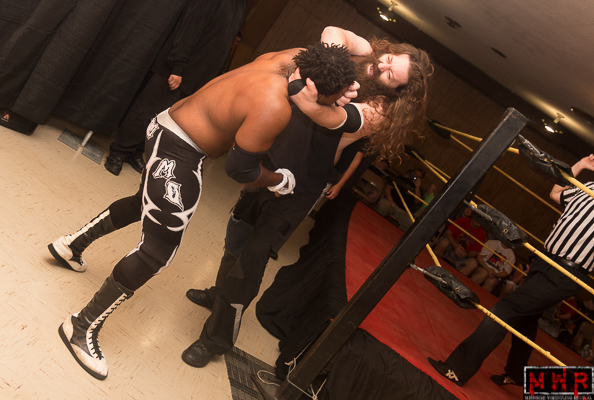 Snitch cheated to win their previous encounter, so payback was the order of the day…however, Snitch hid in the audience during C.J.’s entrance to attack him from behind. 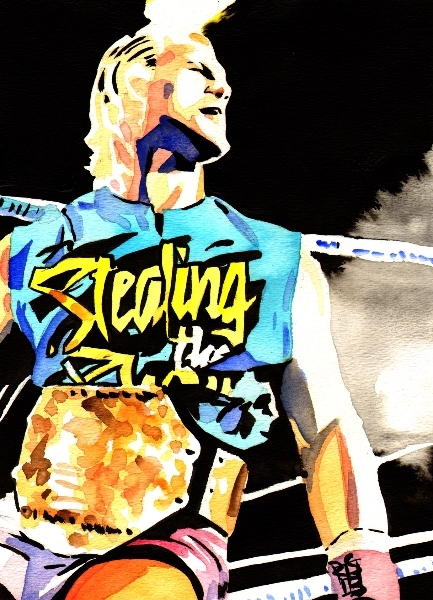 Shine is gaining popularity, which is a good sign…it’s just a matter of how well he does against more established opposition. 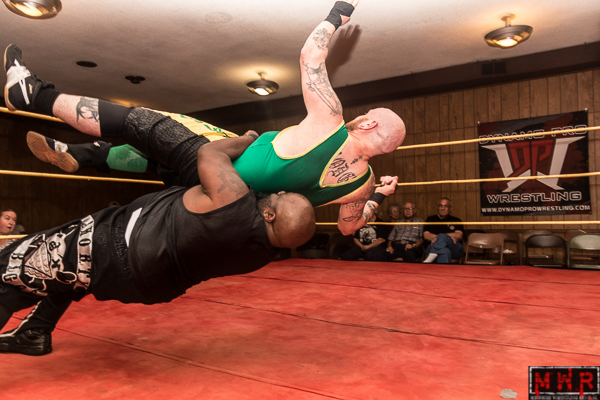 Shine went to the top rope to finish, but Snitch pushed the referee into the ropes to knock him off balance…causing him to land rather painfully on the top turnbuckle. 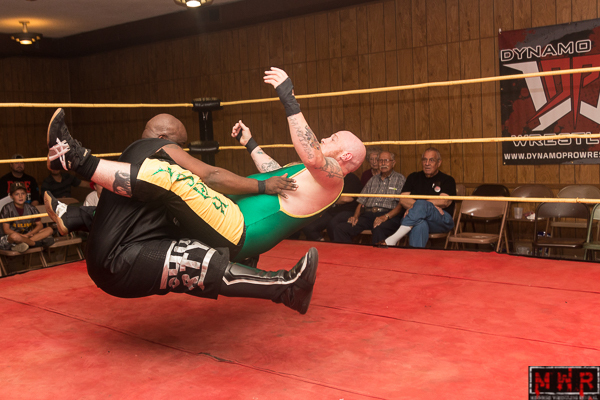 Snitch capitalized by covering with feet on the ropes for the tainted pin in 9:01…aww. 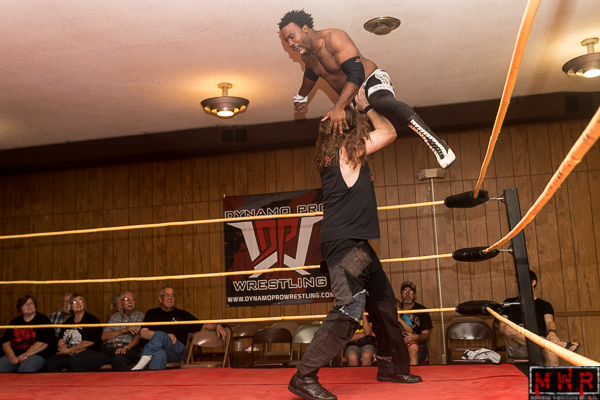 Shine got some post-match retribution with a top-rope missile dropkick(not enough headroom in the venue for a springboard move). Rocket Mapache vs. Orange Lazarus: O.L. is a new masked character…he seemed oddly familiar but I can’t quite place it. 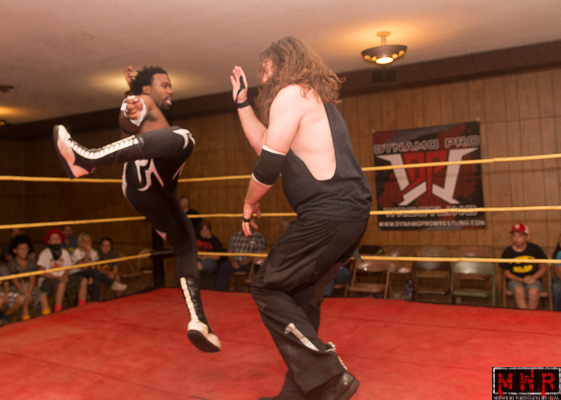 I felt like I’d seen this match at some point in a past life…not sure why that was the case. 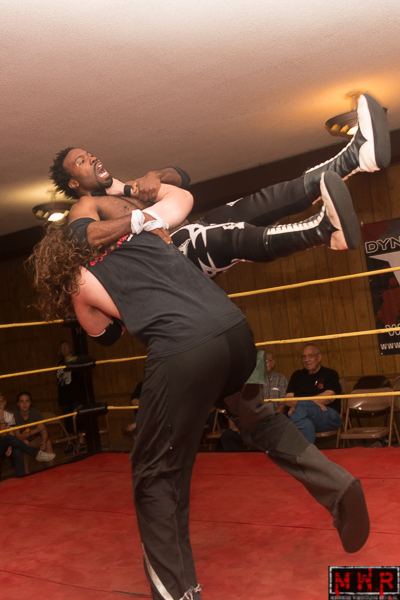 At a few points during the match, Lazarus was left motionless on the mat only to do an Undertaker-style “Zombie Sit-Up” as if rising from the dead. 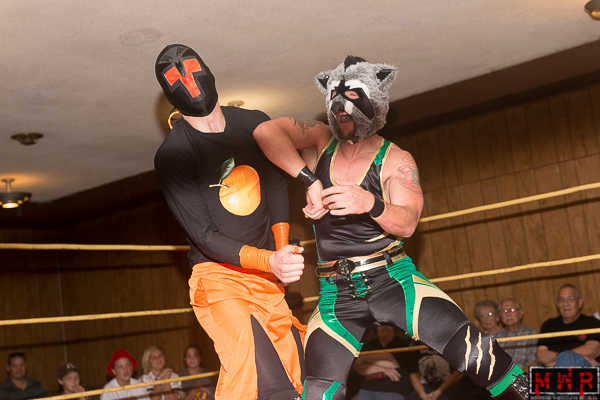 This freaked out Dynamo’s resident raccoon, but he managed to rebound and win after a Codebreaker followed by a flying boot in 6:42. 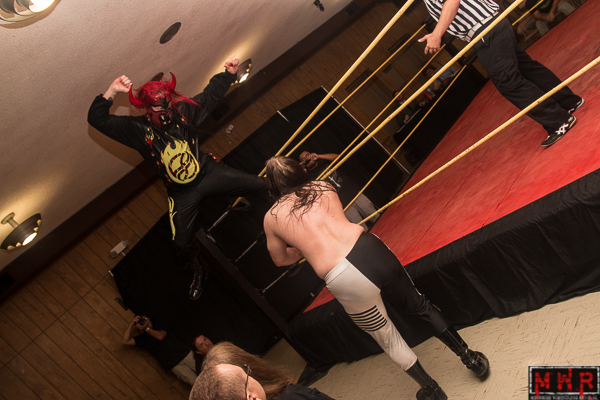 Makaze vs. “The Alternative” Ozzie Gallagher: This feud has progressed over the past several months…Sadie Blaze returned to Dynamo and took exception to his former protege’s tactics, especially as it related to the masked competitors. That led to Sadie taking matters into his own hands and bringing his very close personal long-time friend Makaze into the battle. 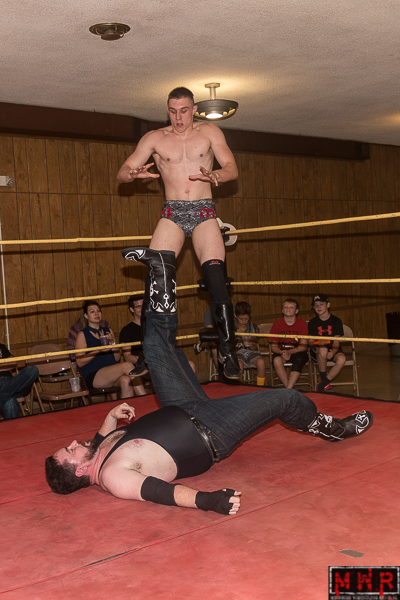 Gallagher won their first outing after a low blow, but he wasn’t quite as sneaky in the rematch and got disqualified for the same nefarious tactic. I’m still getting used to Makaze being FAR more vocal than he had ever been in the past…previously he had remained silent and let managers or tag team partners do his talking. 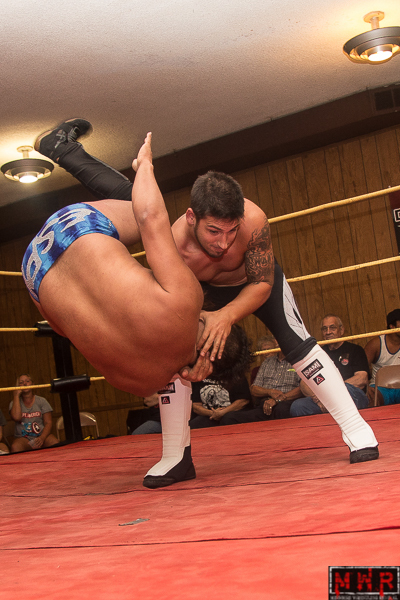 Makaze even encouraged the fans to chant “Brandon” to antagonize the one who had previously gone by that name. The Wind Of Destruction had pulled his own share of dirty tricks in the past so he knew exactly how to counteract them…the chessgame went in the favor of “age and treachery” in this case. Makaze was able to stun Gallagher with a mulekick to the Universal Weak Point out of the referee’s line of sight, scoring the pinfall in 16:43(!). 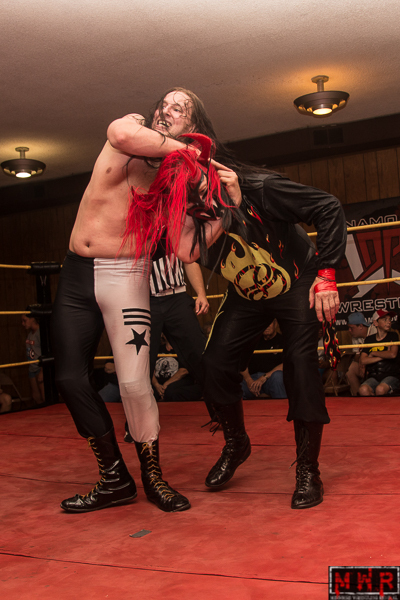 After the match, Makaze said that he hoped Gallagher had learned a lesson…he didn’t believe in using such tactics, but this was an exception as he was fighting fire with fire. Gallagher remained stubborn and challenged Makaze to one more match to settle things, but he wanted Makaze’s mask to be on the line. Makaze was fine with those terms…as long as Gallagher put his hair on the line as well. 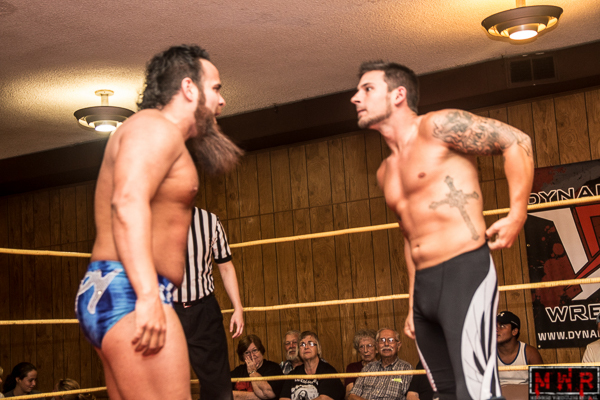 That grudge match has been set for Saturday, September 17th in Glen Carbon…mark your calendars, as they say. Intermission~! I shouldn’t have settled for ramen noodles for my homebound dinner as I indulged a bit on this night. Your Official Ben Simon Concession Count(tm)(Part One), as he was ring-announcing for Pro Wrestling Resurgence: Bag of barbecue potato chips, one Pepsi, and a Hershey bar. 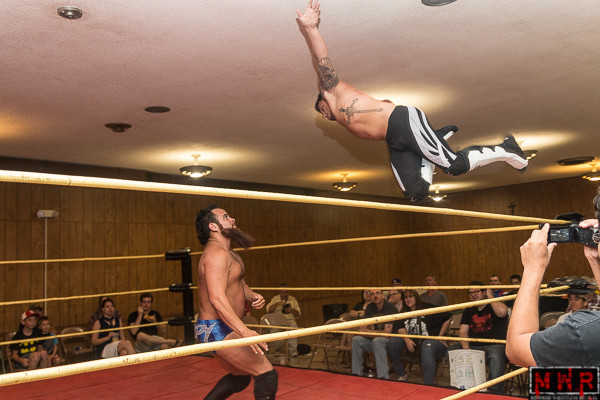 Tag Team Champion Jon Webb vs. MWR Missouri Champion Brandon Espinosa, non-title: Espy had a whirlwind night ahead of him as he was scheduled to wrestle on all three area events (and did so). 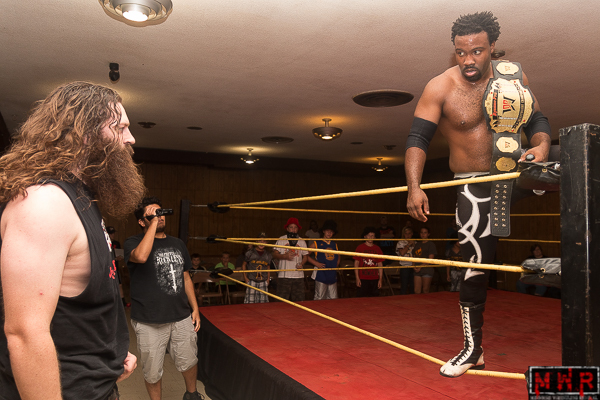 The MWR Missouri Title was not at stake as the match was on the Illinois side of the river; normally the belt doesn’t even make an appearance in that situation, but Espy wore it to the ring anyway. Webb is set for a big match at World League Wrestling next week as he battles Jayden Fenix in a no-DQ match to determine the first WLW Jr. Heavyweight Champion; he was the fan favorite here despite being in the rulebreaker role with tag partner Jack Gamble at NatsuCon. They had a really good competitive bout that could have easily gone either way…Webb hit the Sliced Bread #2, but the time limit expired at 15:00 for the draw. Espinosa was notably respectful to his opponent afterwards, saying he would love to do Five More Minutes(tm) but he had a full night ahead of him elsewhere…he’d be cool with a rematch down the line, perhaps even in Missouri so he can put his belt at stake. Cue handshake with no shenanigans. 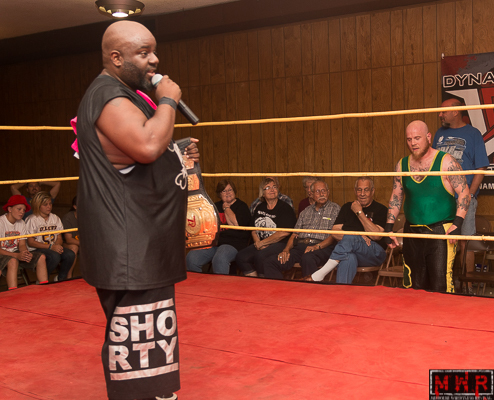 Outtkast vs. “The Don Mega” Shorty Biggs for the D-1 Title: Outtkast’s challenger was determined by a random draw and turned out to be his longtime tag team partner in The Bumrush Brothers, creating this first-time matchup between the two. 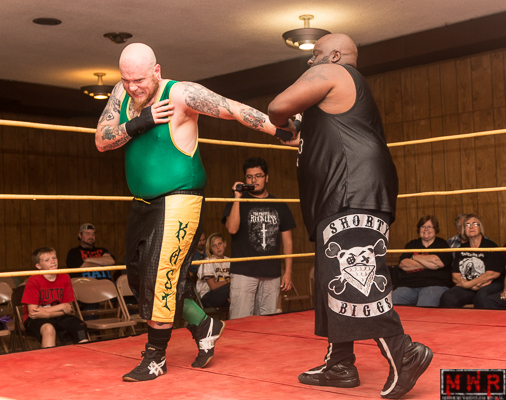 The team formed back in the days of Gateway Championship Wrestling and won the GCW Tag Team Titles in November of 2006, defeating the team now known as The Submission Squad (Evan Gelistico(Petrie) and Pierre Abernathy). As you might expect, the two know each other very well and this wasn’t the brawl you would normally expect out of the individual competitors…both are extremely underrated on the technical side and they got to show that in this bout. I really enjoyed this bout as someone who is familiar with their extensive history…they both turned up their aggression but not to the point of outright heelishness against a longtime friend. 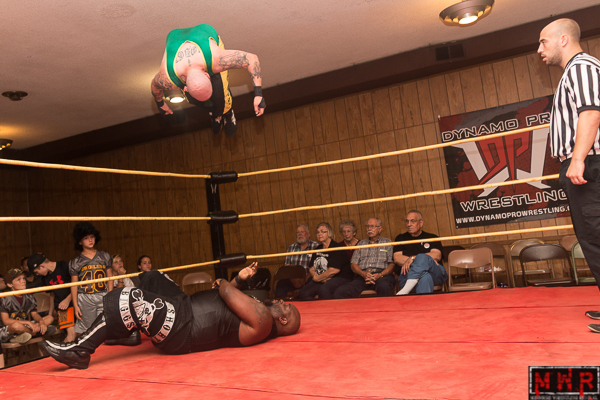 Outtkast couldn’t use his power-based moves against Shorty so he had to go to his aerial arsenal, landing his corkscrew senton off the top rope for a close near-fall. However, Outtkast went to the well once too often and missed the move on the second attempt; Shorty capitalized with a Paydirt and then a fireman’s-carry Michinoku Driver, picking up the decisive win in 16:05 to capture the D-1 Championship! 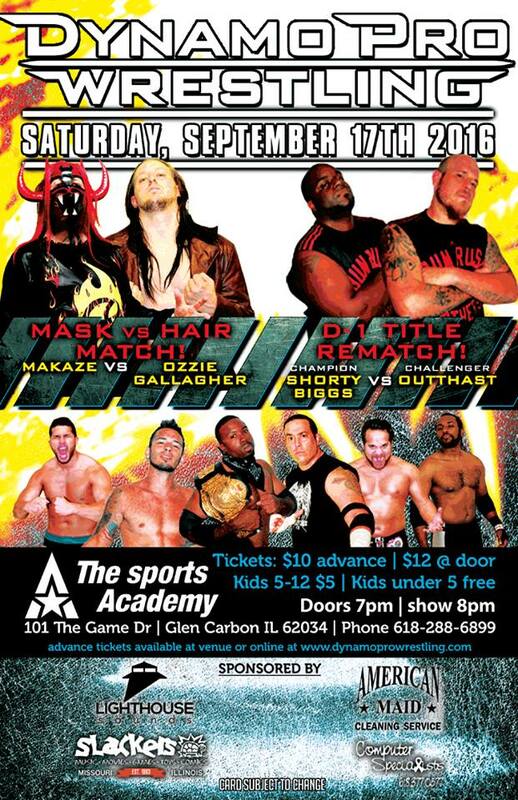 It was Shorty’s first singles championship since he won the Lethal Wrestling Alliance Heavyweight Title in 2007, something that Shorty made mention of…he said Outtkast could have a rematch anytime he wanted one, so it looks like that’ll be a go for September 17th. 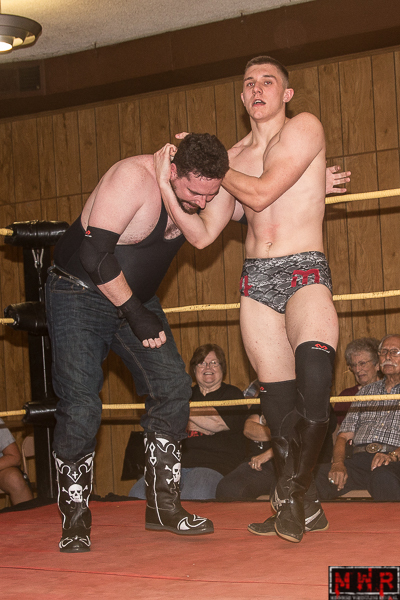 “Dirdey” Jake Dirden vs. Mike Outlaw for the Heavyweight Title: When Outlaw upset Ricky Cruz for the Heavyweight Title in December of 2014, he faced a lot of tough opponents; none was tougher than Dirden, who won the championship under controversial circumstances in May of 2015. 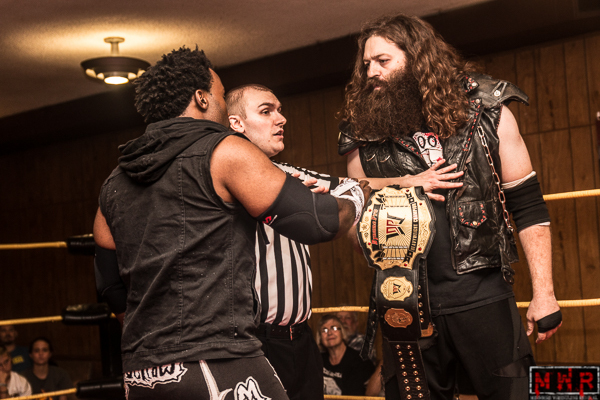 In the year-plus since that time, Outlaw had to deal with a lot of obstacles in his quest to regain the championship…all of that finally culminated in this one-on-one bout with no Mark Bland, no Travis Cook, and no Black Hand Warriors to interfere. 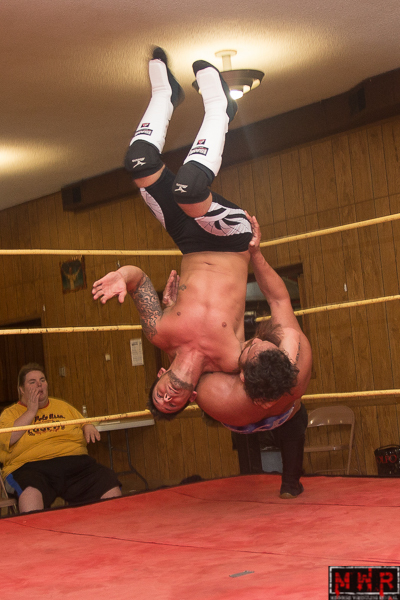 Dirden had the advantage when the match turned into a brawl on the floor, throwing Outlaw over several rows of chairs and nearly winning by countout. 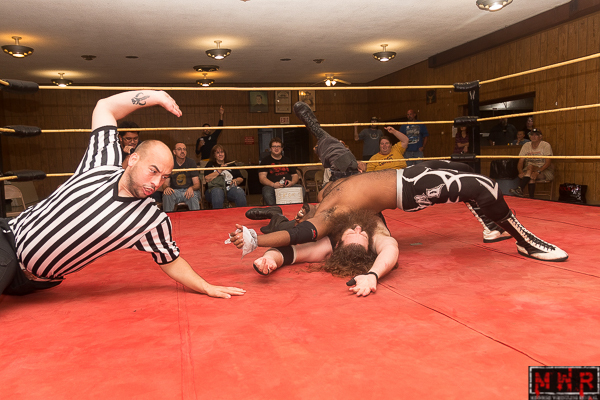 As the battle continued, the referee was knocked down, leading to a visual pinfall for Dirden after a chokeslam. 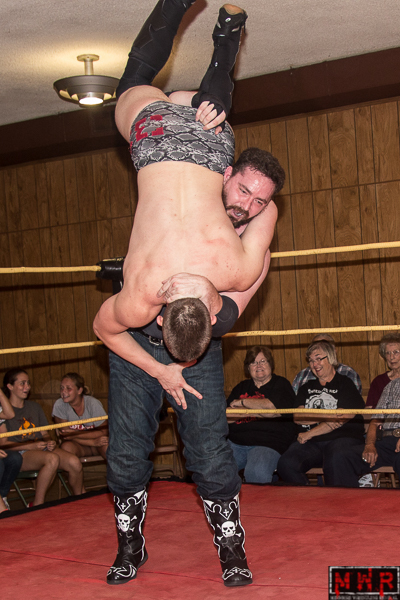 Dirden brought in a chair, but that backfired as Outlaw dropkicked it back into his face. 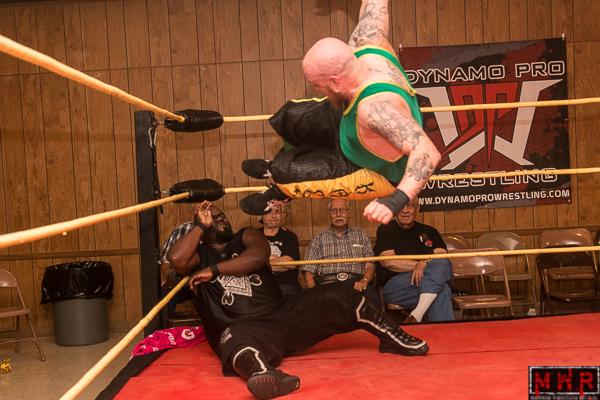 Outlaw delivered the High Noon(top-rope elbowdrop) and the referee recovered to count…two. Dirden fired back with a big boot but took out the ref AGAIN by mistake. Outlaw springboarded off the second rope for a flying European uppercut, but Dirden was able to get a hold of the chair and bash Outlaw with it. Dirden covered and a second referee ran in to count…two. 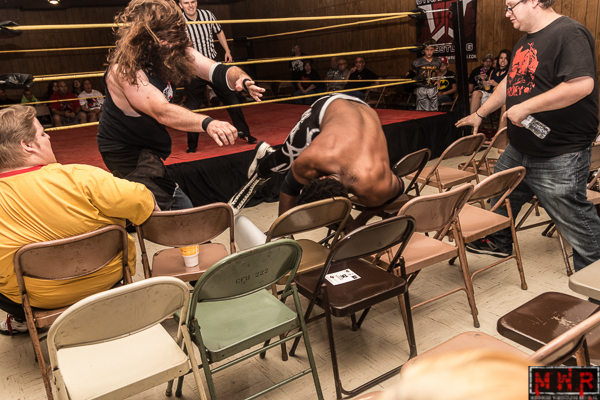 Dirden wedged the chair between the turnbuckles as the second referee assisted the first to the backstage area…but Outlaw reversed Dirden into the chair, then used the chair to his own advantage by beating down Dirden with it. 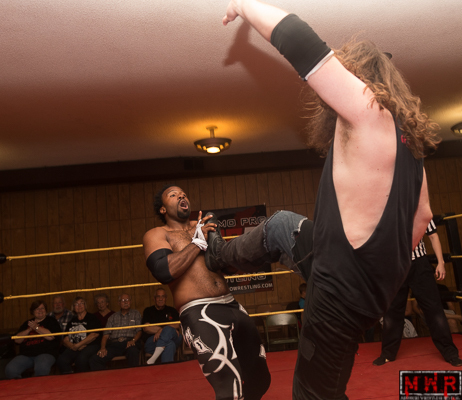 Outlaw delivered the Mafia Kick as the second referee re-entered the ring and covered…for two. Outlaw wasted no time in keeping up the pressure, dropping Dirden with a second Mafia Kick and then going to the top rope for a second High Noon. Three counts later, we had a NEWWWWW Heavyweight Champion! 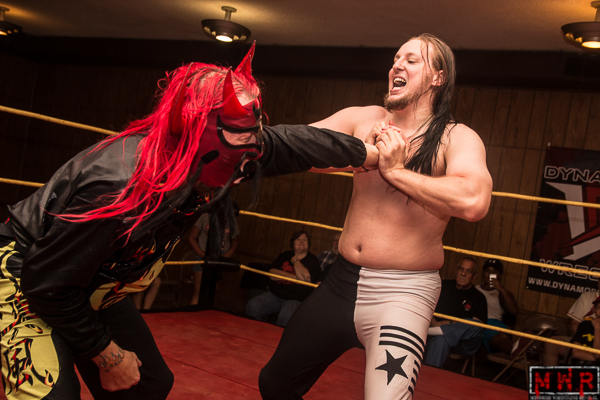 Outlaw was ecstatic over finally reclaiming the gold…he said Dirden had ducked him for over a year, but he wouldn’t do the same and offered Dirden a rematch whenever he wanted it. After some hesitation, the two shook hands to seal that deal. This entry was posted on September 3, 2016 at 1:08 pm	and is filed under Uncategorized. Tagged: "The Don Mega" Shorty Biggs, "Vietnam Phenom" Bao Nguyen, Brandon Espinosa, CJ Shine, Dynamo Pro Wrestling, Jake Dirden, Jon Webb, Makaze, Matt Kenway, MWR, Ozzie Gallagher, Patrick Brandmeyer, Ric Maverick, Rocket Mapache, ROH, Sadie Blaze, Snitch, WWE. You can follow any responses to this entry through the RSS 2.0 feed. You can leave a response, or trackback from your own site.